First United Methodist Church will be the setting this tonight for Downtown Candlelight Christmas: A Night of Christmas Readings and Carols. 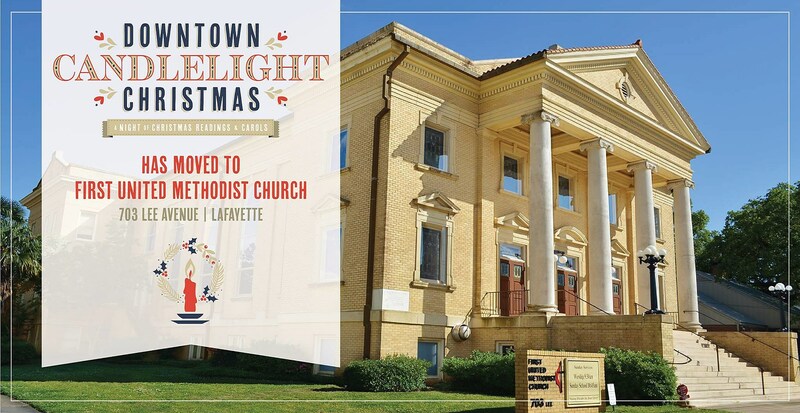 This free event presented by First United Methodist Church and Downtown Lafayette will take place from 6-7:00 pm and is open to all. Come hear the narrated story of a Savior born to a virgin in Bethlehem, interspersed with the singing of traditional Christmas carols, as led by local musicians. Those local artists will include The Rayo Brothers, Sean Bruce, Ray Boudreaux, and Julie Williams. The event will be a great opportunity for families and friends to head downtown for something moving and sweet. And it is quite the time to be downtown, as seasonal decorations are set up and the city Christmas tree will be on display. Additionally, many downtown shops and restaurants will be embracing the holiday season with a multitude of gift opportunities and specials to fit the season.